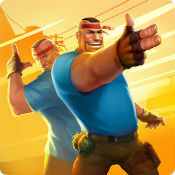 Guns of Boom v3.3.0 Mod apk for Android. Links removed due to DMCA notice. Its asking for update. Please update..
Stop crying. You deserve to be banned when you cheat. After installing the game, I can not connect to my game account where I am level 17, what to do? My account was blocked please fix the error pistol was not equipped in the game. My Account has blocked….. what can I do. the update does not work redirects google play store as I am pressing, the open returns to please update to latest version to continue playing. I am asking for help. Fixed. Download the newest version.